Guaranteed Coverage – This warranty is guaranteed to be there for when you need it most, and is backed by American Banker’s Insurance Company, an AM Best A Rated Insurance Carrier! Towing, Trip Interruption, and Service Call Benefits – This policy provides unmatched support to help cover the financial burden of towing, trip interruption costs, and service call charges associated with RV Breakdowns! An Exclusionary RV Warranty is the highest level of coverage offered. It’s simple, under an Exclusionary Warranty, EVERY component on your RV will be covered, except for those items specifically listed under the “What is Not Covered” section of the policy. These are items such as maintenance items, or breakdowns caused by weather, vandalism, or collision. 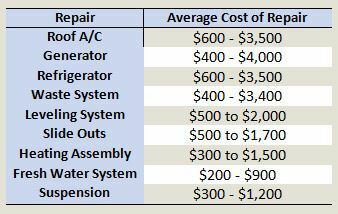 This is what you want if you do not want to worry about the potential cost of RV repair and mechanical breakdown. This makes the coverage easy to understand you only have to refer to the list of exclusions when determining the types of breakdowns that will or will not be covered by the contract. *Canvas: Vinyl, Body Adjustments, Fiberglass Top, Hubcaps, Metal Supports, Frame or Structural Separation, Hoses and Rubber Parts, Distributor Cap/Rotor, Battery and Cable, Weather Stripping, Normal Fluid/Oil Lubricant Seepage, Service Adjustments and Cleaning, All Fabric; Walls: Wood and Panels, Tires/Wheels (unless purchased), Bumpers, Carburetor; Throttle Body Physical Damage, Repositioning, Refitting, or Resealing, Air Bag/Restraint Systems, Light Bulbs/Headlights, Brake Rotor/Drums, Shop Supplies, Hazard Waste Removal, Exhaust System (Except Manifold), Rust or Corrosion, Squeaks; Rattles; Water Leaks, Shower Tub; Stall and Basin, Upholstery, Buttons; handles; door hinges; glass; mirror fasteners Nuts, bolts, fasteners, attaching hardware; mounting brackets All maintenance service and items such as alignments; wheel balances; engine tune-ups; spark/glow plugs; brake pads; linings and shoes; filters; lubricants; coolants; hoses, belts, plug wires. This Exclusionary Motorhome Warranty will protect you from the costly breakdowns on your RV.